Patrick Combs in "Man 1, Bank 0"
Don’t miss this amazing-but-true, hilarious and unforgettable story of how Patrick Combs deposited a $95,093.35 junk-mail check marked ‘non-negotiable’ – hoping to spread a little banking cheer to tellers – and how it erupted into a staggering and funny David vs. Goliath-like adventure. Broadway World said it’s, "One of the FUNNIEST, most FASCINATING and FASTEST moving solo plays to hit New York in many a season. Ninety minutes of NONSTOP LAUGHTER, it's also an EDGE OF YOUR SEAT ADVENTURE loaded with UNBELIEVABLE real-life surprises," "Combs has his storytelling down to an art," said Time Out NY. See this outrageously funny and dramatic comedy that consistently wins awards and wows audiences everywhere. Smash hit sold out runs in New York, at the Just For Laughs Festival in Montreal, at the Spoleto Festival in Charleston, at HBO’s Comedy Arts Festival in Aspen, at the Olympia Theatre in Dublin, at the Soho Theatre in London, and at theaters around the world. The Orlando Sentinel called it a, "Spectacular comedic triumph" and said Combs has "Flawless comedic timing and remarkable stage presence." "A gift raconteur," said the Houston Press. "Superb storyteller", said the London Standard. "What a magnificent storyteller," raved the Ireland Evening Herald. PATRICK COMBS masterful skills as comedic storyteller have propelled him on a rocket ride that inspired HBO to identify him as one of the "funniest and most talented new performers in America. "Variety Magazine said he has "Star Power." 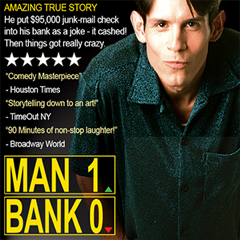 His power-house, international, smash-hit comedy, "Man 1, Bank 0" has been presented by more than 400 theatres in 6 countries. Patrick has appeared on Good Morning America, CNN, The View, NBC Nightly News, ABC Nightly News and The Late Show. His story has been told in hundreds of newspapers including The New York Times, The Wall Street Journal and USA Today.